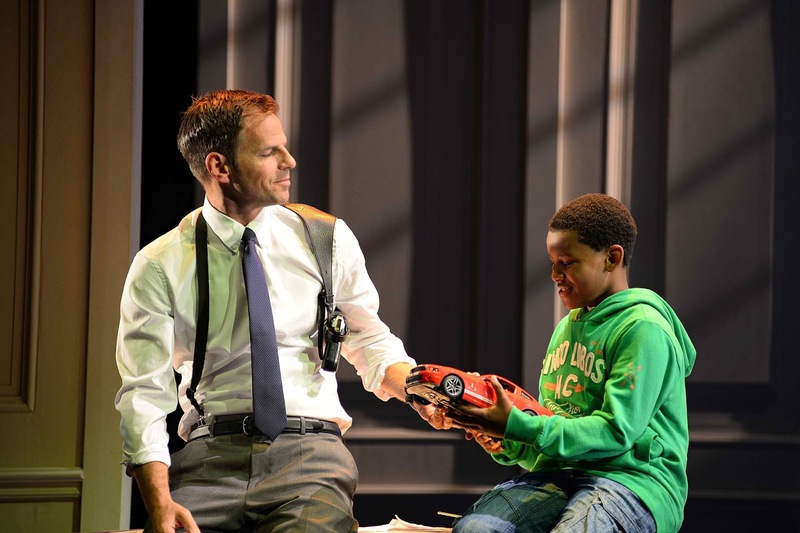 21 July 2016: The Bodyguard is back in the West End, in the huge space of the Dominion Theatre, and this new production takes the spectacle up to the max, with glitter, smoke, disco balls, a video curtain, and even jets of fire. At its centre is Beverley Knight in the role of Rachel Marron, made famous by Whitney Houston in the 1992 film. Ben Richards plays Frank Farmer, the bodyguard that Rachel hires to protect her from a stalker, whose connection to her may or may not have been inadvertently enabled by her sister, Nicki (Rachel John). Whilst following the plot of the film relatively closely, the show manages to include 16 of Houston’s biggest hits, including the film’s iconic number, ‘I Will Always Love You’, here performed humorously as an out of tune karaoke number by Richards, before being taken on fully by Knight at the story’s climax. The show itself is impressively high-tech, and there are some fantastic set pieces: the iconic moment when Frank carries Rachel out of a riot in a nightclub is heightened by being rendered in a giant silhouette, and the moment when Rachel’s stalker arrives at her cabin in the middle of the night is impressively tense. There are also some truly spectacular performances from the cast: Beverley Knight and Rachel John are a phenomenal pairing, and their solo numbers are jaw-droppingly good. John brings a heart-breaking, vulnerable edge to the tragic Nicki, and her performance of ‘Saving All My Love For You’ is a standout moment in the first half of the show. Knight’s performances are equally stunning: whilst ‘I Will Always Love You’ is of course the spectacular climax to the story, her performance of ‘I Have Nothing’ in the first half was, for me, the real goosebump-inducing moment of the show. Amongst two such powerful women, Richards is a little lost as the stoic and deadpan Farmer, although he does make the most of the few moments of comedy that the script allows him. Special mention must go to Jaden Oshenye, who played Rachel’s son Fletcher in the production that I saw. He was a hugely talented, funny, and charismatic performer, and clearly has a very bright future ahead of him. Whilst some of the staging was a little uncertain (the use of the video curtain in particular brought unintentional giggles from most of the audience), and the ensemble weren’t given as much to do as they could have been, it’s clear that the focus of this production is Knight’s voice. In that respect, the show is truly spectacular, and well worth seeing.